Contemporary Malaysian movies seem to fall into three main categories: Malay language movies, Chinese language movies and Yasmin Ahmad movies (this category being “having a Malaysian feel and flavour, regardless of language”). Nasi Lemak 2.0 is not in the last one. If anything, it is in the second. But it gets somewhat close to the Yasmin Ahmad category. Synopsis from GSC’s website: Young Chef Huang (Namewee) struggles to get his restaurant business going because he cannot adapt to the ‘localized’ cooking his patrons are looking for. However, contradict to his unpopular cuisine, he is also well-known as ‘Hero Huang’ in the local neighborhood where he carries out good deed in helping the community until he met Xiao K (Karen Kong) who got him into deep trouble. In order to get his life and the restaurant business back on track, Chef Huang must now seek help from a mysterious hawker stall lady (Adibah Noor), who summons him to embark on the extraordinary journey of his life. During this self-enlightening experience, he will also meet many ‘local heroes’ each lending their support to help him re-discover his roots and the real hidden message of ‘Nasi Lemak’. There are some really funny parts, with the crack at Bollywood movies being the one that made me laugh the most. I think the line was something like “I learnt from Bollywood movies that [the people] are either hiding in the bushes or behind the trees.” Cue camera tracking left and back to reveal – sure enough – one person behind a bush and another behind a tree. I laughed so hard at that! The dream sequence dealing with the Chinese arriving in Malacca and Hang Tuah (or “Han Tu Ya”?) was quite funny too, and included a character brandishing a keris and spouting lines all too-familiar to most urban Malaysians now. They managed to rope in a rather impressive number of local celebrities for small parts in this movie. Patrick Teoh, Reshmonu, Dato David Arumugam, Afdlin Shauki, Dennis Lau (violinist), Nadine Ann Thomas (Miss Malaysia Universe 2010) and the duo Kenny and Chee of Baba and Nyonya fame, to name a few. Adibah Noor had one of the more prominent roles as the nasi lemak seller, but she was sorely under-used, considering the awesome actress she is. All those people being included did mean that there were rather too many characters but fortunately it didn’t get too confusing. To its credit, the movie managed to keep the focus on the main character, despite all the madcap side characters and musical inserts (which were to be expected, given Namewee’s inclination in that direction). Looking at the technical aspects, there’s little to criticise. Editing was pretty good though there were a couple of scenes where I found myself thinking it could have been cut slightly better, but that’s a very mild complaint. I read somewhere that they shot the movie on Canon DSLRs – a good option for a low-budget affair, and the cameras worked very well. The visual effects… were not ultra-realistic. But I cannot fault them because most scenes where such effects were employed were scenes which were clearly humorous ones and/or meant to recall Hong Kong TV dramas. And those HK series – especially the older ones – don’t boast amazing effects work, so the lack of realism here seemed a deliberate choice. Nasi Lemak 2.0 isn’t perfect, and there are a few things that did bug me. Most of what I disliked had to do with the main female lead character, Xiao K. I really didn’t like Karen Kong’s make-up, hair and costume in most of the movie. They gave her those ridiculously thick eyebrows and put her in a juvenile costume (thick-rimmed glasses, t-shirt and shorts, with knee-high socks and all that) with silly-looking, juvenile hair. To make it even more irritating, in the last ten or fifteen minutes, she suddenly undergoes a massive change (for no good reason) and loses the ugly eyebrows and the glasses, lets down her hair and replaces her silly childish outfit with a more feminine dress. All of a sudden, she’s a babe. What for?? So that at the end Huang gets together with a cute girl instead of a geeky-looking tomboy? How contrived. I also didn’t like the beginning very much. Over-usage of “wah lau wei” by Huang. I understand that it was part of the character, but there’s such a thing as too much. It got to the point where I just wanted him to shut up. Thankfully, he quit using the phrase by the halfway point. And the random appearance of Japanese words at the end! What was the point of that? It wasn’t even convincing Japanese, being merely one-word comments like “oishi!” (delicious). I think another was “sugoi” (amazing) but I’m not sure I remember that correctly. But whatever the words, it annoyed me because it seemed to come totally out of left field and was so… lacking in effort. Could they not have found one person to give them a proper sentence or two in Japanese if they really wanted that in? Despite my complaints, it is still definitely an entertaining movie. Behind the humour there are also messages about recognising one’s Malaysian identity, living in harmony and not being racist and all that. It “moralised” a little too directly at parts, but I can overlook that considering all the laughs I got out of it. 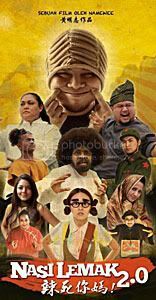 A couple of other reviews have stated that Namewee’s directorial debut bears a resemblance to Jack Neo’s style or Stephen Chow’s. There is a certain tongue-in-cheek humour that recalls Jack Neo’s methods of poking fun at Singapore, and the crazy slapstick is reminiscent of Stephen Chow’s films, so I can’t disagree with either opinion. He’s new to the business yet, so let’s see what Namewee does with future efforts. He won’t be aping Yasmin anytime soon (who could?) but just going by Nasi Lemak 2.0, there’s the potential for him in the comedic direction. It’s a movie worth watching for a good laugh. No need to think very hard, just enjoy the ride.